Letter to Membership regarding NRC’s response on the China Trade Restrictions. Letter sent to the WTO on behalf of the NRC. On July 18, 2017, China notified the World Trade Organization (WTO) of its intent to ban the import of certain scrap materials by year end. On September 13, 2017: draft revised “GB 16487” Environmental Protection Control Standards for Imported Solid Wastes as Raw Materials, with further restrictions on allowable prohibitives. On November 15, in a series of eleven filings with the WTO, China’s Ministry of Environmental Protection proposed adopting new limitations of allowable prohibitives in materials being shipped into China. WHAT IS THE NRC DOING ABOUT THE TRADE BARRIERS? China’s declaration to prohibit the importation of solid waste is based on improper terminology and a presentation that secondary materials prepared as raw material for recycling is categorized as waste distorts the environmental claims issued by China. WE request WTO to utilize internationally accepted definitions for trade negotiations, including the NRC definition of recycling. Quality standards should be set on already established internally acceptable industry standards, such as the standardization guide for bale quality in the ISRI standard commodities and scrap market specifications. These standards are embraced and utilized by recycling markets within North America and through ISRI member companies in at least 34 countries globally. The NRC requests the WTO for consideration of utilizing the standards of bale quality utilizing these global ISRI adopted standards as a basis for resolving quality issues with China’s GB 16487 claim on allowable prohibitives. The NRC also request the WTO to impose an extension of time for any import restrictions, as the sharp deadline of March 1, 2018 cannot be reflected with significant operational changes in the US recycling industry. The NRC requests that WTO engage between the parties involved as a arbitrator. NRC believes building, expanding and improving infrastructure in the recycling sectors in both the US and China will greatly benefit the environment and the economy in both countries. In the US, fundamental core changes are needed to ensure that this industry will be less subject to the vagaries of other nations and commodity prices. Using a focused systems approach and working together as an international industry, we could work to stabilize the market. However, this is a long-term solution and one that will simply not meet a March 1, 2018 deadline for reducing prohibitives in recyclables. WHAT CAN YOU DO ABOUT THE TRADE BARRIERS? The discussion evolving around the China restrictions of prohibitives and contaminants requires a focus on quality. Such concerns also involve American MRFs as they attempt to meet bale international shipping standards. The ISRI standards are the quality standards that American MRFs rely upon to meet their business needs. However, local recycling collection programs often are unfamiliar with these quality concerns. Education Quality: All of our local education programs could be re-tuned to empathize quality control. Residents have been trained to recycle as much as possible, sometimes to the extent of “when in doubt, throw it in the recycle bin.” This push for quantity may be over-riding the quality needs of our recycling industry. Retooling the local education programs for quality is a great start toward addressing the trade barriers we are faced with today. Collection Quality: Local collection programs around the US have moved primarily to single-stream recycling collection through traditional trash collection vehicles. As such, the collection of recyclables is compromised to some degree through compaction and full mixture of all commodities. It is time for our collection programs to focus on quality of materials as they are delivered to the local MRF. This may involve the search for higher quality collection vehicles, the consideration of separate collection for cross-contaminate materials, and the reduction of compaction on recycling vehicles. MRF Quality: The brunt of the international shipping restrictions lies on the MRF operator, thus the focus on quality is front and center at your local MRF. You may have noticed resistance from your local MRF operator in regards to adding new potential curbside recyclables, as adding to the mix adds complexity to the contamination equation. As residuals are defined through composition studies, some of the residual quality concerns are sourced from residents, some from collection compaction, and some from MRF processing quality issues. Yet, it’s the MRF operator that has the responsibility to market the material received from the community. It’s a community wide issue that requires community wide attention toward quality. As the recyclables we collect are commodities, they are raw material in lieu of virgin materials for manufacturing. The Bureau of International Recycling (BIR) estimates that more than 40% of manufacturers’ raw material needs around the world are met through the recycling of obsolete, off-spec, and end-of-life products and materials. The added value through recycling is directly related to the investment in quality collection and quality processing. In essence, we recyclers are generating the feedstock material for industries to make new products and packaging. We may be focused today on feeding China’s industrial production system, but perhaps we should refocus our attention on America’s recycling industry. As I previously stated in an editorial on June 20, 2017 in Resource Recycling Magazine, the National Recycling Coalition (NRC) strongly supports efforts to invest and improve our country’s aging infrastructure. The recycling industry particularly needs a 21st-century transportation system to efficiently transport raw materials and feedstocks to manufacturers throughout the nation and the globe, including increased capacity and investment in all modes of transportation, covering rail, surface and waterways. All infrastructure projects could generate far more jobs from the reuse and recycling of buildings and roads and the use of recycled and recyclable materials wherever economically and technologically possible (for example, use of rubberized asphalt in road construction and use of rebar from ferrous scrap). NRC also believes that investing in American recycling infrastructure would provide an excellent return on investment and leveraging of federal funds. Support of American recycling infrastructure would enable America to bring home recycling jobs from overseas, and dramatically expand the three-quarters of a million jobs and tens of billions of dollars already occurring in economic activity. Instead of shipping half of all recovered recyclables to overseas markets, a refreshed recycling infrastructure will support new American end markets, manufacturers and businesses creating closed loop material streams and lower transportation costs. Today’s rapidly evolving waste stream requires an upgraded recycling infrastructure from collection to processing to manufacturing. Recycling industry experts note that the “evolving ton” reflects the light-weighting of PET containers, a significant reduction in newspaper in the consumer stream and a significant uptick in old corrugated containers (OCC) known as the “Amazon Effect” due to internet sales and home delivery. Single-stream materials recovery facilities (MRFs) that service residential communities were not designed for these consumer shifts and are in need of redesign and expanded capacity. End-users and remanufacturers also need to reflect these consumer shifts. The “evolving ton” creates pressure points throughout the value chain from consumer product redesign and sales all the way through the recycling system, requiring a full upscaling of the American recycling infrastructure. Investing in America’s recycling infrastructure is an investment in American jobs, in the American economy and in reducing costs for businesses that will provide an excellent return for the investment of federal, state and local funds. Consider creating a local recycling incubator research lab at your local university, through research grant funds. Innovation can advance recycling to create a new American leadership on the international recycling stage. We are challenged with gaining higher diversion and higher quality, at a low collection and processing cost. Can we invest in the research toward collection changes and MRF processes to gain high quality recyclables? Talk to your local economic development office about locating recycling jobs to your community. Note the linkage between local economic development and the recycling circular economy. Note the growing green job network, the ability to control the end destination of your recyclables by placement of end markets in your own community. Recycling remanufacturing offers a new and growing tax base, clean manufacturing, stable employment opportunities, and the synergies of locating processers and end users in the same proximity to the reduce carbon footprint of your recycling program. We ask our NRC members to focus on delivering quality recyclables to the local MRFs, and seek local Investment in the American recycling infrastructure – in your local community! Recycling needs your help! Donate here on Giving Tuesday for a better tomorrow. We are the national voice for recycling, so please support us today. Together we are recycling! We are the voice for recycling. 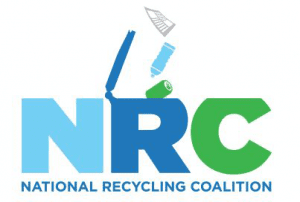 The National Recycling Coalition (NRC) is a national non-profit recycling association and advocate positioned to assist the recycling industry and sustainability-minded corporations to weather unpredictable and damaging conditions that loom in the recyclable-commodities markets. We represent every sector of the recycling industry from individuals, to local governments, non-profits and private haulers and manufacturers. Our organization advocates for collaboration between these sectors to ensure robust markets and a quality supply of those materials. The recycling industry is at a critical turning point. In 2016 mainland China imported approximately 16.2 million tons of recyclable materials from the United States, earning U.S. companies, governments, and citizens over $5 billion. In early 2017, China issued a notification with the World Trade Organization to severely limit recyclable materials entering China. For over four decades, our quest has been to bring all sectors of the industry together, to enhance the future of recycling. These recent actions by the Chinese government means domestic markets need to be reinvigorated – NRC needs your help to do that! We are committed to the future of recycling. NRC recently hired a new Executive Director, who will accelerate and elevate the industry for you and for future generations for a stronger recycling economy and a better environment. With combined contributions from donors like you, we will deliver workshops and provide assistance to recyclers throughout the U.S. to enhance recycling operations and find alternative destinations for sending materials to be remanufactured. Donate today. With your generous contribution, the NRC will work at a grass-roots level with local communities, recycling trade organizations, and manufacturers to help prove our nation’s resilience and forge new economic markets for recyclables in the US. America Recycles Day – What did you do? How did the NRC celebrate America Recycles Day this year? Click Here for a full list of ARD events organized and hosted by NRC Board Members! What did you do to celebrate America Recycles Day? Share your events with the NRC by connecting via Facebook or Twitter (@nrcrecycles)!! America Recycles Day (ARD), an initiative of Keep America Beautiful, is a nationally recognized day dedicated to promoting and celebrating recycling efforts in the United States. For the past 20 years, thousands of local event organizers mobilize throughout their community to educate friends, colleagues and classmates about recycling on or around Nov. 15. One of the biggest barriers to recycling is knowing what items can (and cannot) be recycled. In honor of America Recycles Day 2017, the National Recycling Coalition, is working with Keep America Beautiful (KAB) to promote and spread awareness of what can and cannot be recycled. We invite you to plan your own ARD event by taking advantage of the wide variety of tools and resources available to make event planning easy and impactful. Once planned, register your event so it is officially part of the national network of America Recycles Day events! Events can occur at any time during the fall leading into the official America Recycles Day celebration on Wednesday, Nov. 15. Events can be as small as an exhibit in front of a retail location, a bill insert to your community residents on what can be recycled or as large as a collection event for the entire community. What is important is spreading the word about the recycling Dos and Don’ts in your community! Additionally, as part of the America Recycles Day campaign, we encourage you to invite your network to join the movement by taking the #BeRecycled Pledge. This pledge is a promise to actively choose living a recycled lifestyle by committing to “Reduce. Reuse. Recycle and Buy Recycled.” in all aspects of daily life. For questions, contact Isaac Nicholson via email or 202-688-0604.